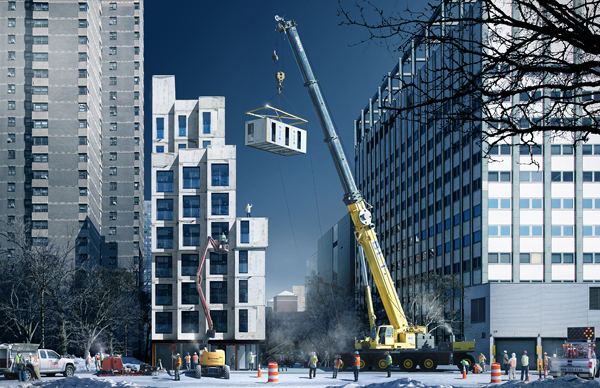 New York City‘s first-ever entirely micro-unit housing complex is being stacked together on Manhattan‘s East Side. Back in February, we wrote that the modules for the nARCHITECTS-designed building were being assembled at the Brooklyn Navy Yard, and now we can report that they have begun arriving at their permanent home in Kips Bay. The project, which is being developed by Monadnock, won Michael Bloomberg‘s adAPT NYC Competition in 2013 and was originally known as My Micro NY. It has since since been given the more conventional-sounding name: Carmel Place. Each of Carmel Place’s units measure between 260 and 360 square feet and offer nine-and-a-half-foot-tall ceilings. If tenants are feeling a bit cramped, they can lean over their Juliette balconies for some air, or step into one of Carmel Place’s (non-micro) communal spaces like the gym, lounge, or terrace. The 11-story building is slated to be completed by the end of the year and will have a mix of market-rate and subsidized units, and housing for veterans. 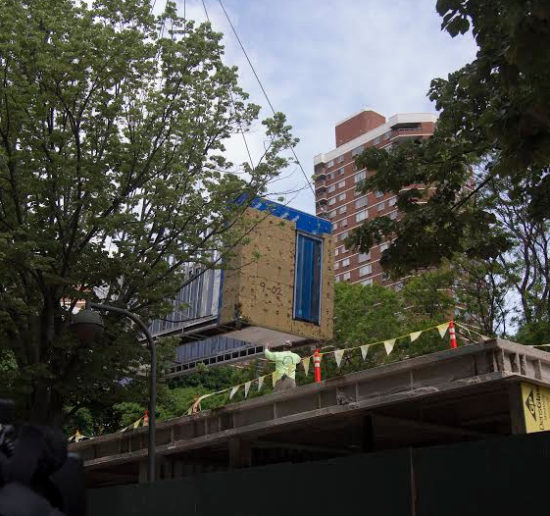 The market-rate units will be listed between $2,000–3,000. You can watch the installation process in the video above, made by Lloyd Alter of Treehugger.